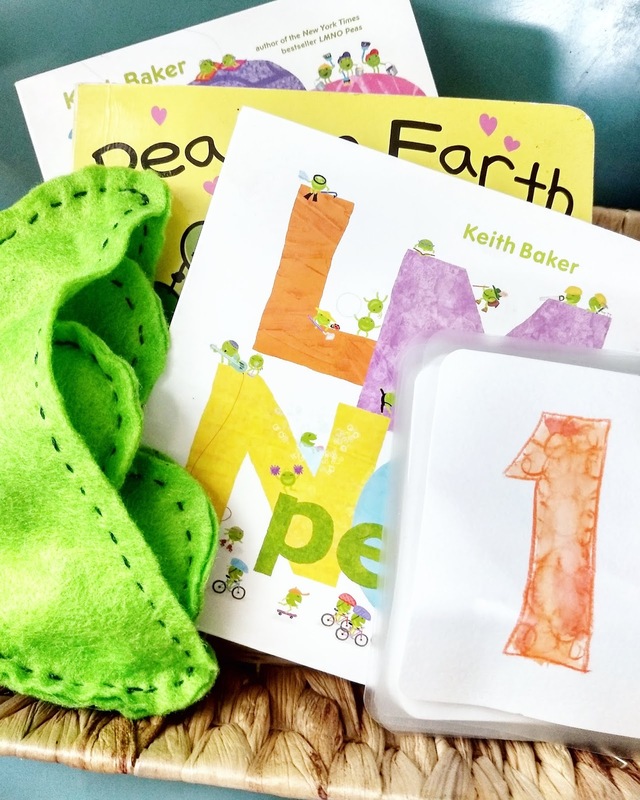 Hello, Wild Things: "Peas" read me a story! "Peas" read me a story! I keep seeing these "story baskets" on Instagram and thinking I could put one of those together pretty easily. It's basically a smaller version of what I do for my job every day. So when I realized I had found a few a books that had a common theme and were age appropriate for my little guy (about 9 months) I got really excited. The only problem was the theme I had landed on... peas. I mean, that's a little weird, but I didn't let that stop me, because my motto is "limitation leads to creativity!" Or, you know, it would be. If I adopted a motto. I do realize it's kind of silly to give flash cards to a 9 month old. Right now I'm just using them to help my kid familiarize himself with numbers. 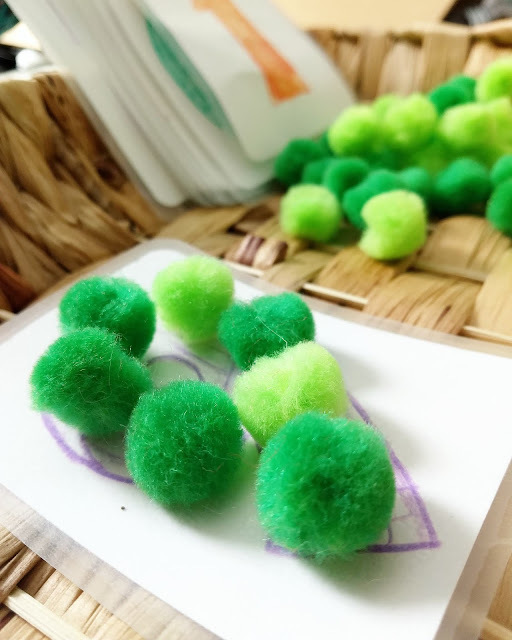 But if you are making this basket for a toddler the puffballs and flash cards used together can be a great learning activity. They can either trace the shape with them like I did in the picture or pull out as many "peas" as is shown on the card. The best part of this whole basket, in my opinion, is that adorable little pea pod toy. 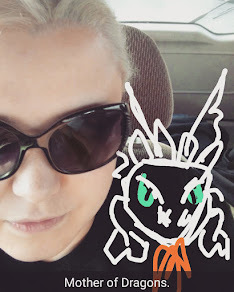 As soon as I thought of the concept I knew I had to make one. Each little pea is a different type of noise maker. So one rattles, one squeaks, and the other crinkles. And it was pretty easy to make, too. Step 1: Make and cut out a pattern. 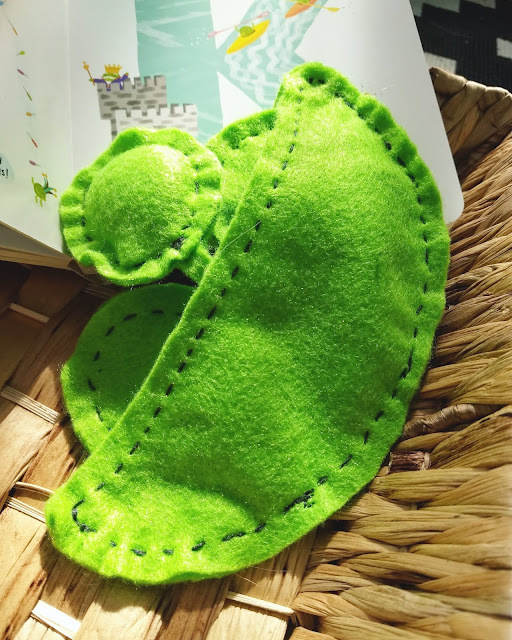 You'll need a pea pod (kind of a fat crescent moon shape) and a pea (make sure it will fit in the pod when it's all sewn up!). Step 2: Fold your felt in half, pin, and trace your pattern to make sure you have enough room for everything. You're going to need two pea pods pieces, six pea pieces, and three long thin strips to attach everything together. Step 3: Cut. Triple check to make sure everything fits before you do. You know the saying "measure twice, cut once?" I always measure like, five times. Step 4: Make your noise makers. The squeaker is the most fun, and the easiest. Just tear apart the dog toy until you've found the plastic piece. It should be a circle with a tube sticking out of it. 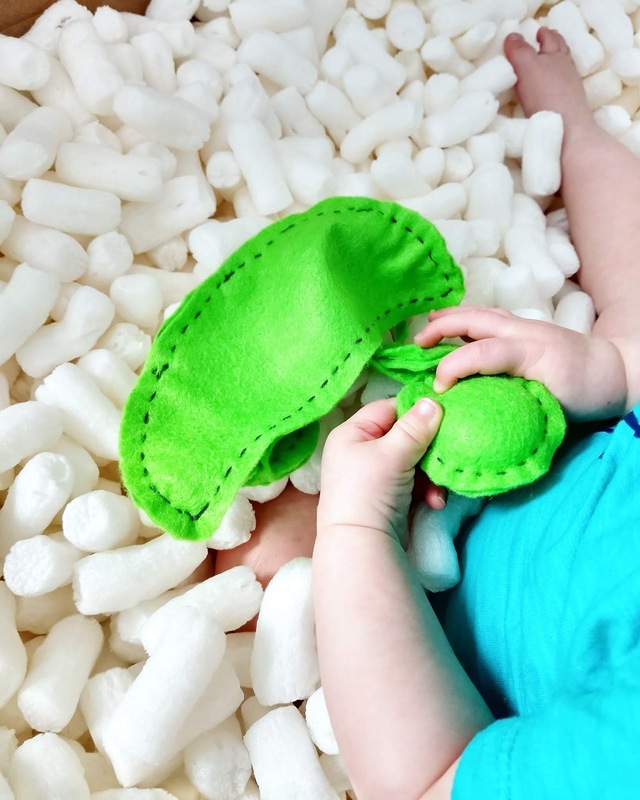 For the crinkle pea, you want to cut out two or three pieces of your noisy wrappers a little bit smaller than the felt pea pieces you cut. The rattle is the most complicated. I cut 2 circles out of an old plastic bag, then taped it to make a pocket. Pour rice in about half, then tape it all the way around. You should come out with a kind of flat circular shape that makes noise. Make sure you test to see if any rice comes out when you shake it. Step 5: Put together the peas! Note: Make sure you pin on the long pieces that will attach the peas to the pod! There needs to be one sewn onto each pea. For the crinkle pea you can just pin your crinkle layers in between your felt layers and sew around the edge. For the squeaker pea I sewed around the edge until I had about an inch left, then pushed the squeaker inside and sewed it closed. For the rattle I just pinned it (carefully) into the middle and sewed around it. Step 6: Sew up your pea pod. When you're pinning the pod together, make sure to pin on all three peas. I attached the long strips to the bottom of the pea pod. This isn't necessary, but it makes sure that you don't have to keep chasing down peas. Sew up the big curve first, putting extra stitches where your peas attach. I added a line of stitches across the top of the pod to make everything look complete. And there you have it! Your pea pod is done, and a great addition to a "Peas read me a story!" story basket. 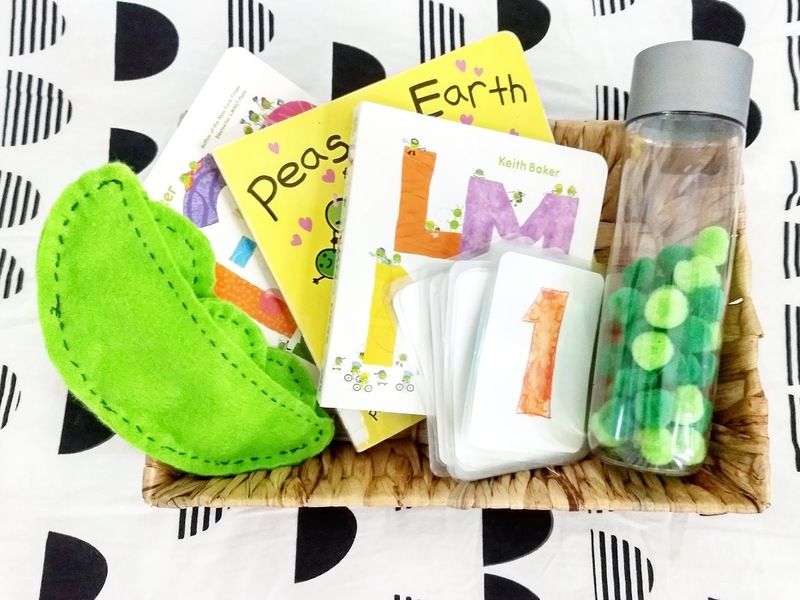 If story baskets aren't your thing, a veggie felt set would also be so cute.